It doesn’t take much to get the creative juices flowing in the NetEnt slots development studio. 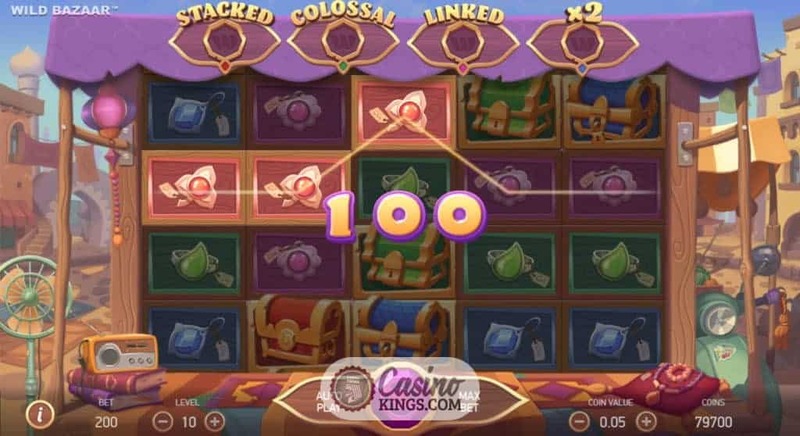 Known for its wide variety of fanciful slots, NetEnt gives us slots on pretty much any subject and theme. 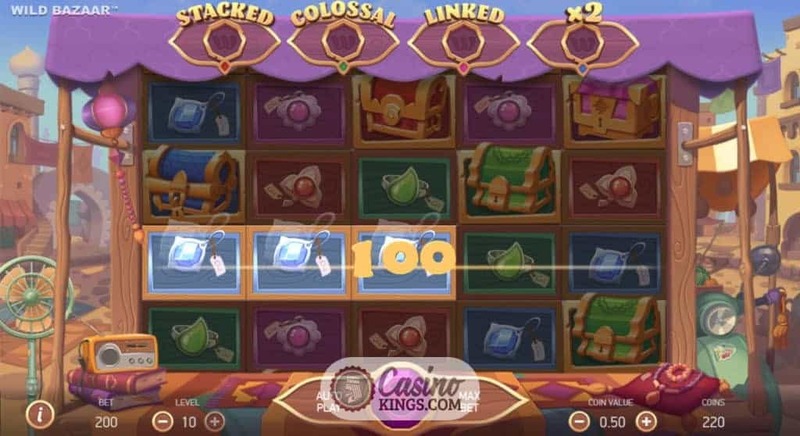 So we imagine somebody was talking about their trip around the bazaars or re-watching Aladdin when the magical Swedes cooked up the concept for this Wild Bazaar Slot, and the brainiacs in the office decided there and then that it was time to make a slot based on a gem-filled shopping bazaar. Okay, that might not have happened. But what did happen was the creation of the five reel, 26 payline slot, Wild Bazaar, and for that we can be eternally grateful. There’s no need to travel to Arabian lands to enjoy the wares of this local market. 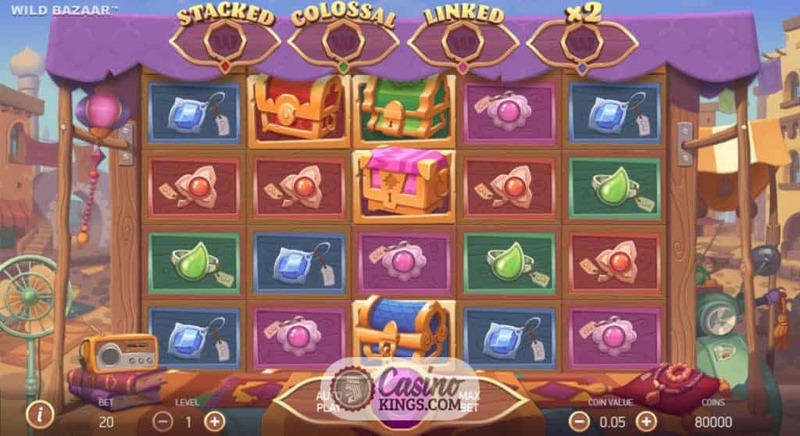 NetEnt’s Wild Bazaar Slot fully immerses us in a place that reminds us very strongly of Aladdin’s Agrabah. The reel case is set up on a market stall and we get to see what’s on offer. A range of shiny trinkets coloured Purple, Blue, Orange and Green, are the low paying symbols, while Treasure Chests of the same colours also open up a world of promise as our high payers. But that’s not all they open up. When three, four or five appear across a payline they multiply our stakes and earn us 20, 40 and 150 respective coins in the process. With a fan spinning away on one corner and a banged up moped in the other, we can’t beat the authenticity of this slot. And just like in real life, we can separate the wheat from the chaff and uncover some real gems among the trinkets. It wouldn’t be a trip to an Arabian market without something unconventional. And this slot delivers that in abundance. Actually, it delivers it four times with the Wild Spins features. The Treasure Chest symbols each trigger their own Wild feature. 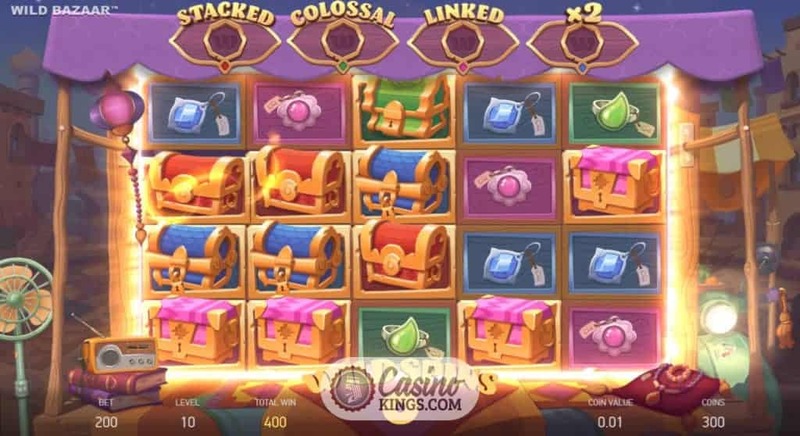 For instance, three or more Red Treasure chests launch Stacked Wilds; three or more Green Treasure Chests give us Colossal Wilds; three or morePink Treasure Chests give us Linked Wilds and three or more Blue Treasure Chests give us x2 Multiplier Wilds (and breathe!). At the top of the reel case, these are signposted and, when each is triggered, the relevant indicator lights up to let us know that our winning streak is about to take place. 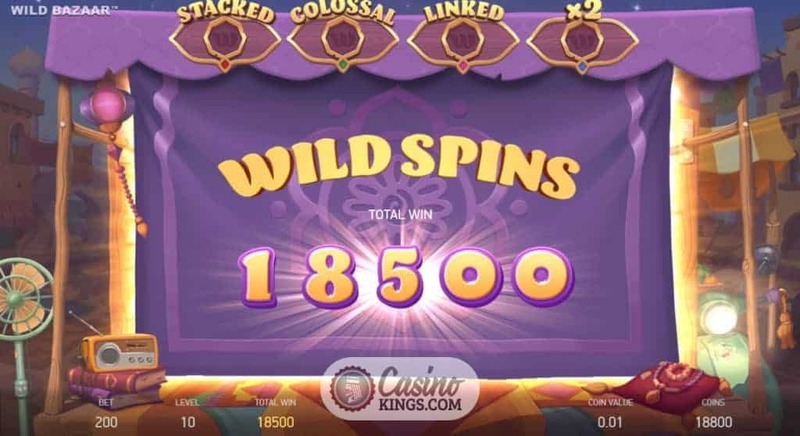 Instead of conventional free spins, we get four Wild Spins instead, each of them incorporating the traditional Wild feature, along with some added extras that help us land those wins. 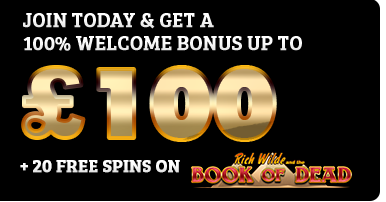 In fact, with the x2 Multiplier Wilds, we can get up to 390 times our stake on a single spin. Now that’s one heck of a trip to the market. 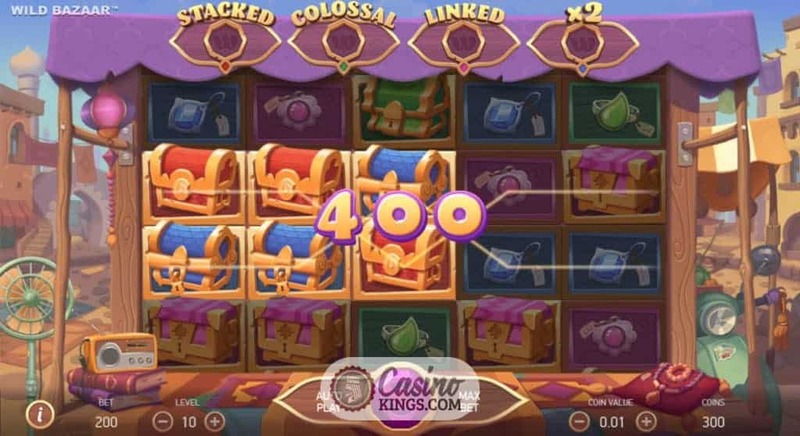 As a low variance game, Wild Bazaar Slot pays out reasonably well, especially when any of the four Wild Spins come into play. But just wait for multiple Wild Spins features to come into play at the same time. And these spins occur frequently, too, so whenever we want to take a trip to the market, we know which slot we’ll fire up. 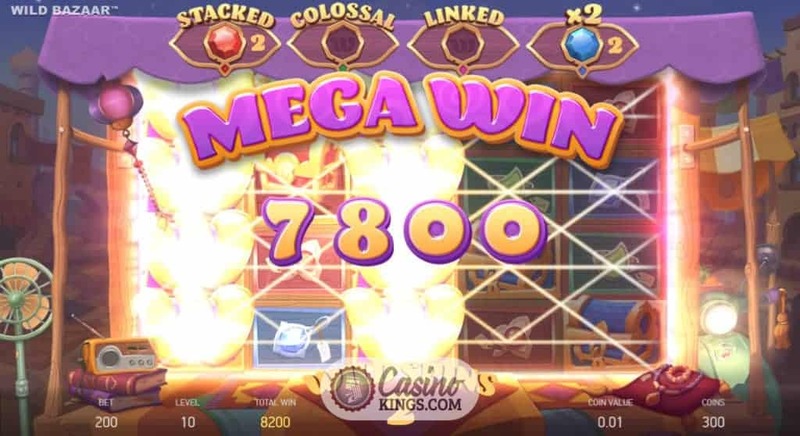 Are you on board this slots magic carpet?